Gmail is the most used email service by users. Millions of home and business users are using it. But it has been found several times that users want to save a backup of Gmail data. To simplify the backup of Google Mail account, we have come up with some simple solutions in this post that would prove to be fruitful for users. What could be the reasons for Google Mail Backup? Gmail account could be hacked by the hackers and all your important messages could be deleted. By backup, you can save your valuable information from hackers. Sudden deletion of messages due to involvement in multi-tasking. You can protect your information from losing through backup. As Gmail has only 15 GB of data. When the storage limit exceeds, the users can save their important emails to access locally to their system and to save them from corruption. How to save backup of Gmail account data? To download the backup of Gmail account emails, a user can get several methods. Here, we are providing two solutions for users that prove to be useful for users. Let us know both the methods completely with their advantages and disadvantages. If you want a free solution then you can try Google Takeout service. It is a free service to download emails of Google Mail account into a zip file. After extracting the backup file, you will find data in MBOX format. Login to your Gmail account with login credentials. Choose a delivery method to takeout emails from Google account. Choose Send Download link via email. Click on Create Archive to start the archiving process. After its completion, click on Download and wait for the files to download. When you extract zipped files, you will find the data in MBOX format. Now, you can easily move MBOX file to your desktop client. MBOX file format is well-supported by 17+ email clients including Thunderbird, PocoMail, Postbox, Seamonkey, Spicebird, Apple Mail and others. But when you think of moving MBOX files in Outlook. It is not possible as Outlook works with PST file format. For this, you have to convert MBOX files into Outlook supported PST format. For this, use MBOX to PST Converter third-party utility that will simply convert MBOX files into PST format whom you can simply import in Outlook 2019, 2016, 2010, 2007, 2003 etc. The method seems to be simple and free for users but takes a huge time to complete the process and for a large amount of database, the users have to wait for hours. In this way, the process becomes lengthier. 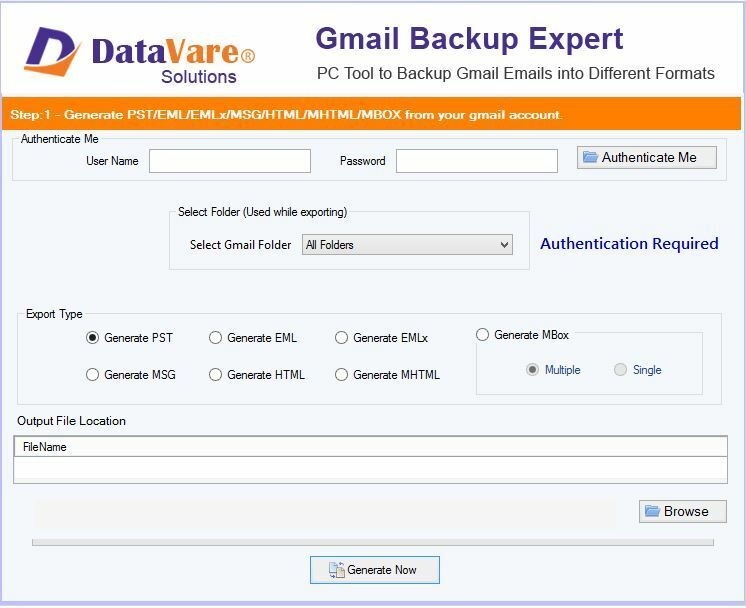 If you are searching for a quick and short method, then you must try Datavare Gmail Backup Tool. It is a well-examined tool by the professionals so you will surely find correct results without any issues. There is no trouble of data loss and waiting for hours with this utility. The software is developed to provide fast results. Initially, download and launch Gmail Backup Expert successfully on your Windows machine. Once you open the application, provide username and password of your Gmail account for whom you want to save the backup. The third step is to choose the folder whom you want to backup. You can select all folders for entire emails backup. In this stage, you need to provide a location to save the exported PST files. This could be any path of your desire. Hit the Generate Now button to start the process. Select PST file to move it in Outlook and click OK. The Software is very simple to utilize and takes only a few minutes to save backup of Gmail files into PST format. Moreover, you can save Gmail emails into several other formats using this utility like MBOX, EML, EMLX, and MSG. The software provides 100% accuracy in backup results. One by one multiple Gmail accounts backup is taken using this program. In the above write up, we have mentioned two amazing solutions that provide safe and secure conversion of Google emails into PST format of Outlook. However, Gmail to PST Exporter software is in the most demand by the users and highly recommended by the experts to get quick results without any issues. No doubt, Google Takeout service will also work but takes a little more time.